As announced last week, here is the moment you have all been waiting for! Run in conjunction with MapCore.org and lasting 4 full weekends, this mapping challenge with stretch your imagination and abilities to the limit. It’s time to fire up hammer and let those creative juices flow. We’d like you to re-imagine a scene of your choosing from any of the Half-Life games. To be clear, we are NOT looking for remakes of any scenes – we want you to completely re-imagine a scene. Think of this as a What if…? concept. What if somebody else pushed the cart? Gordon was late, so they got somebody else and the resonance cascade happens when Gordon is still on the tram. It crashed to the ground but leads him to a previously unseen section of Black Mesa. What if Half-Life’s infamous research facility were hidden underneath a city or town rather than out in the desert? This particular event occurs on the side of a Citadel. Yes, it doesn’t fit the story, but that’s not important. This is about high cliffs and long falls. What if Black Mesa were devastated by this game’s nuclear bomb quite early during the story, leaving Adrian Shepard to navigate a version of the research facility resembling a post-apocalyptic nightmare? Instead of arriving at a city train station, Gordon finds himself in a deserted and derelict village station, perhaps near enough to Ravenholm, to feel the threat. Being seen by Civil Protection may be the least of his worries. What if the Combine had chosen the United States, France or London to be their primary city? The only limitation is your imagination, which we ant to see run wild – create the most wonderful interpretation of Half-Life’s universe that you can conceive. Whether your project is big or small, you should strive to create something that will delight all Half-Life fans. Originally it was 14th April, but after popular demand it has been extended. Maximum one map per mapper per entry. The map must have a least one enemy and one weapon; i.e. playable. The map must run in a system with only Ep2 installed. By entering the competition you grant RunThinkShootLive.Com and MapCore.org the right to release the map as part of the RaiseTheBarVille Mod. Maps must not appear for download before the release and for one month after the release of the mod. The organizers’ decision is final and no correspondence will be entered into about it. Each entry should be accompanied by a correctly formatted (vtf) background and chapter image. The name is not important, as it will have to be changed. As has been said earlier. We are NOT looking for you to simply recreate a scene in a new engine. You can however, use assets from Black Mesa. Prizes are being given by both sites. A lightly used hardback copy of Valve’s rare Half-Life 2 development book Raising The Bar. This book is a must-read for any fan of the game, and particularly those interested in the development process. In addition to being collectable in its own right, this edition is signed by valve staff. This has been kindly donated by Don aka Unq and the signing has been arranged by a friend of Phillip’s at Valve. Don’t feel bad, you nearly made it. Have a plush companion cube plus a MapCore mug or T-shirt, and know that we love you. All entries, except the Winner and Almost winner, will be entered into a random draw to win Sniper Elite 3. As always, the services of BetaTestersCollective.com should be considered. Because this is a joint challenge, there are two places for this. Please use this post to discuss the challenge and share progress of your work. For your updates, please create a new comment each time, rather than replying to your first update. There is also the challenge thread over on MapCore where you can do the same. Both will be complied for post-challenge judging and articles, so you don’t need to post in both places, although it’s not a problem if you do. There have been a few questions asked about this challenge, so hopefully this will help you. However, if you question is not here and you have doubts, please don’t hesitate to ask, no matter how small your query. Can I use assets from Black Mesa Source? Yes, by all means, but you must pack them into your BSP. Yes, we know that may mean redundancy, but the map MUST run in a system that ONLY has Episode Two installed. We don’t want to force players to download BM. Can an entry be a joint entry? Yes, but there I still only one prize. You’ll have to fight to the death to decide who gets it. Which games can I re-imagine? Can I use assets from Lost Coast? Yes, pack them into your BSP. What about recreating a scene that was say… cut from one of the main games? Technically a re-imagining of a re-imagining. No, but you could use the cut area as inspiration for something that was released in one of the games. What we don’t want people to do is remake a cut section from a game. Can simply change a location? Well, yes, but again, there should be some element of “What if…?” in the map. Simply changing a town for a city is only part of what we are looking for. You map should really be the result f some change, however minor, in the story. How do you define a scene? In the context of this challenge a “Scene” is a part of the game that has some effect on the following game. So, changing one location for another is not really enough. What we are looking for is something that takes the game in a different direction. Can we submit mini-mods instead of a map? Sorry, no. You entry must be a self contained map. Can I submit something artsy? Sure, but it must have at last one enemy, one weapon and a player spawn. Can we decompile or remake specific locations from Valve maps? We think it’s best if we disallow this. Mainly to avoid any potential problems. Please start your map from something new. However, we will allow a very small section if this is just used to “fit into the story”. For example, in Episode One, at the beginning when Alyx and GOrdon are thrown into the Citadel. If you map started at the bottom but then things went very differnt from the game, that would be okay. How should I start my map? We suggest a little text at the beginning to set the scene. Something like…”What if Gordon were late and somebody else push the cart? Let’s find out“. It’s not compulsory but it might help. What’s the limit of changes we can make? Wow, that’s a tough question. Your changes MUST NOT affect maps that may be after yours in the final mod. Ask in the RTSL post or MapCore thread. Somebody will respond quickly. We really hope that you have fun with this. MapCore and PP/RTSL has a long history of supporting maps and mods for the Half-Life games. As such, we’re hopeful that both communities still have the passion for one of gaming’s finest classics, and is keen to apply modern-day skills and technologies to bringing Half-Life’s universe to life – because valve sure isn’t doing it any time soon! Anything that has Half-Life in the name is fair game. I’ll be entering this but reporting my progress over at MapCore. This is a very cool theme! It’d be easy to come up with some fun ideas. I wish I could submit a map, but unfortunately I’m on a student exchange to London until later this year…. Here’s a question regarding the We are NOT looking for you to simply recreate a scene in a new engine. bit. What about recreating a scene that was say… cut from one of the main games? Technically a re-imagining of a re-imagining. Good Question. I am going to make an executive decision for both sites and say NO. Let’s stick to what was released, that way there’s no discussion. Now here’s another problem, the other idea I have did appear in HL2 as a heavily modified and combined area. I’d be de-making the area, is that acceptable? I mean, there are references to said area in the book with some concept images but that would probably make up only 5% of the complete map. I’m talking about Nova Prospekt in the final game but I’d be interested in making some version of the Depot/Air Exchange based on the original ideas that Valve had but later got turned into Nova Prospekt. So does it sound like a re-imagining of Nova Prospekt or more of a remake of something that doesn’t even appear in Half-Life? That’s the hard question. Also, is it okay if I post my progress in a third place but provide the hyperlinks to said place? Seems like your objective is to ask difficult questions! Think of it this way… You are re-imagining a scene not a location or style. Take the IDEA of the scene and make it any how you want. If the scene appeared in any of the games, you are good to go, if the scene didn’t, then you are not. Yes, you can post progress anywhere you want. I guess this begs the question: how do you define a scene? Some of the examples above are very broard (City 17 and Black Mesa). At first I assumed we’d be taking maybe a level or a specific scenario from one of the HL games and re-imagining it with a twist. I’m now thinking it’s a lot more loose than that…? Well, it’s more of the idea behind a particular section of the game. So, as another example; Nova Prospekt: Basically, you have t work your way through a prison -agreed? Well, there can be many types of prisons. What about a forest with a 30 metre wall around it? That’s a kind of prison. Anyway, I think the best thing to say is email directly about your particular idea and I can discuss the details with you. I think what people are getting at is how much does it have to read like the scenario it is based upon? Does it have to be clear to an experienced player what scene the mapper is riffing on? By your example, it seems very broad. I could create any kind of holding environment and say it’s based on Nova Prospekt, and then do whatever gameplay I want. That starts to remind me of DoorVille and how nothing really felt “grounded” to the main game because the connection was really tenuous. It became a “build whatever you want” comp. Yes, you are right, my example of Nova Prospekt was not very good because it was simply a location. What I am trying to say is the scene you want to use should be obvious to a fan of the series. Ideally, the map would have some text at the beginning to set the scene, but that’s not compulsory. I almost feel that if we are too specific, we limit the creativity. It’s about saying “What if this happened instead of this?” or “What if this hadn’t happened?“. As a gamer POV I may suggest you this: Why instead heading Gordon to the Nova Prospekt Prison “SOMETHING”, makes him to take a forced DETOUR and finishes into the DEPOT-AIR EXCHANGE CMB facility, then some mayhem happens there and VOILA!!! You have your entry. Think about the context into HL2 and you will get a cool entry. It’s been a long while since I joined in on one of these. I might try to swing this one. Not going to try and win or anything, but I’ve got a few ideas I’d like to try. It’s going to be hard to pick just one scene though. But I think I know just the one for me. Glad you are thinking of entering. But still, I like this idea! Showing the HL universe in a way people hasn’t seen it before! I always like having a universe to have improvements to make a very old and now-boring game (to some), and resurrect it into something new and fun! 😀 I guess that’s what RTSL is all about! Ok, thank you, Phillip! My apologies for the impatience. Does anyone know of a way to achieve low gravity without affecting other maps? Trigger push (upwards) doesn’t work and the sv_gravity console command doesn’t automatically reset from map to map. The only solution I can think of is to put “sv_gravity 600” into all the chapter.cfg documents and that seems a bit much to ask. A trigger_gravity, no? You can end the map with another one to set the gravity back to normal. *Facepalm* I thought trigger_gravity was supposed to be boolean. I thought it didn’t work. Thanks. Ok. I’m all out of ideas for this one. So, if I wanted to begin from the middle of a scene already in the game with a different outcome than the scene from the actual game, should I start with the beginning of the scene, or how would this work? To answer this properly, I’d like you to contact me directly and tell me the “scene” you have in mind. Without knowing the exact details, I would say start with the original scene, as long as it’s not too long, and then flow into your re-imagining. I really like the idea around this one. It’s a shame because I was already starting into building on my entry from the last contest. That, plus I probably won’t be able to devote my time to this like last time, especially not throughout the month. The concept is really open though, and I already have a couple good ideas for this stirring. I’ll have to decide how plausible they are before the weekend. I’m intrigued to see what happens with this! I’m joining in. Re imagining C17. WOW!!! I’m so eager to see this as a pure gamer POV!!!!!!!!!!! I think we will have some awesome entries I’M so eager to put my eyes on and play them!!!!!!!!! The past 3 (including this) mapping challenges have a good theme to it, and the last 2 fully released Ville challenges are very well made! I hope to see a lot of good content! Due to popular demand, the deadline has been extended two weeks to: 11am GMT Tuesday 28th April 2015. DOH! Well spotted. Fixed, now. Thank you, then I choose to tell the canal story in a different way. PS : Does any of you have a good tutorial for making a 3Dskybox with the citadel ? If you have never finished or released a map, might I suggest aiming for smaller than a “moderately big” map? Better to have a really well made, but small map than a bigger map than isn’t as good. Always think quality over quantity. 20 minutes worth of gameplay for a beginner is HUGE. Just make sure you get it tested early and often. You are not allowed to release the VMF or BSp before AND one month after the mod is released, but you can show any images any time. No Ideas! Initiate backup plan! This should go in the actual announcement post. So I got a good Idea but then I read that its not enough to simply change a location. Okay then. I am this close to giving up. That’s a shame, but okay. I was not planning to enter this in the first place, because of my current mod focus, but I would agree that the theme is really amorphous. Something that is close enough to an existing scenario to be identifiable, but not so close that it’s a remake? Then, on top of that, all of the examples provided are very “expensive” from a creation standpoint. They all seem like they demand custom assets to do right, or re-purposing content from BMS, which I have no familiarity with. I have added an FAQ section, near the bottom. Unlike previous Ville entries, it might be interesting if the final set of maps for this contest are compiled in timeline order for the HL series. For example, if someone does the starting tram ride from HL1, put that first, then any Black Mesa maps, then the starting train ride of HL2, etc. It would be kind of cool to play the maps in “general” order. Excellent idea. I’ll do my best to implement it that way. I have several ideas in mind but none of them seems to fit the theme properly. Some of them involve a story change, but have little to nothing in common with the original environments, while others are more faithful to the original scenes (IE they are actually re-imagings) but have no story change, they’re just an alternate way that particular segment could have played out. It’s mind-melting. Working on anything HL1-related also has a bunch of additional problems – for starters, the challange mod is still going to run on the Episode Two engine, which means that things like NPCs, scipts, scenes and weapons from Black Mesa won’t be usable, which in turn means that making any HL1 re-imaging would require retconning a huge amount of things. As you can probably guess, I have decided to throw HL1 out of the window for this challange. Currently I have two main ideas to follow. Both of these belong to the “actual re-imaging but no story change” category that I mentioned at the start of this post. By tonight or tomorrow I hope to have two environment tests completed, I’ll see which one I like the most and work on that. Also, I think we will need to run a “BetaVille” of some sort in the future. Looking at the HL Wiki I inevitably stumbled upon beta-related concept art and they are super neat. Yeah, I would think that for a contest like this, doing levels in the theme of something from the beta, like Air Transfer, or the Borealis, etc. would have been an easier-to-comprehend choice. This whole “close enough to be instantly recognizable, but not a copy and be as creative as possible” thing is very confusing. Plus, I dismissed all the Black Mesa examples outright because incorporating BMS assets into a mod wouldn’t be straightforward and there’d be a ton of potential conflicts if other mappers used them. I think the best way I’ve heard it explained was during the Critical Jim show. Imagine if Highway 17 was located in White Forest, with all the little buildings and stops along the way. That’s an example I can understand. Unfortunately, I can’t think of too many others like that which would be practical to build. Finally managed to get a bit closer to the look I want the map to have. I had to decompile one of Valve’s citadel maps because I couldn’t wrap my head around the city landscape textures that they used to get the aerial view of City 17 visible from the Citadel. It turns out that they are incredibly messy and misaligned and require special attention to line up properly. However, I did manage to get them to work… eventually. The Citadel model looks a way too huge over the city though, and its textures are way too low-res for how close it is seen in the map, so I’ll have to do something about that. The fog is also problematic because even though I did find a way to make it gradually fade towards the sky, its intensity changes depending on the FOV – on the edge of the field of view the fog tends to become transparent, which lets the player see the “end” of the city surface, which is hideous. Unfortunately this is an engine limiation so I’m not sure how to fix it besides increasing the fog amount. 1. I think the way to use these textures is to make a big surface and Fit to them, add an extra .1 or .01 to the X and Y scale, and then Center it. When you just use Fit alone, HL2 textures have a tendency to create an unsightly seam between edges, which I think I see in your second screenshot. 2. 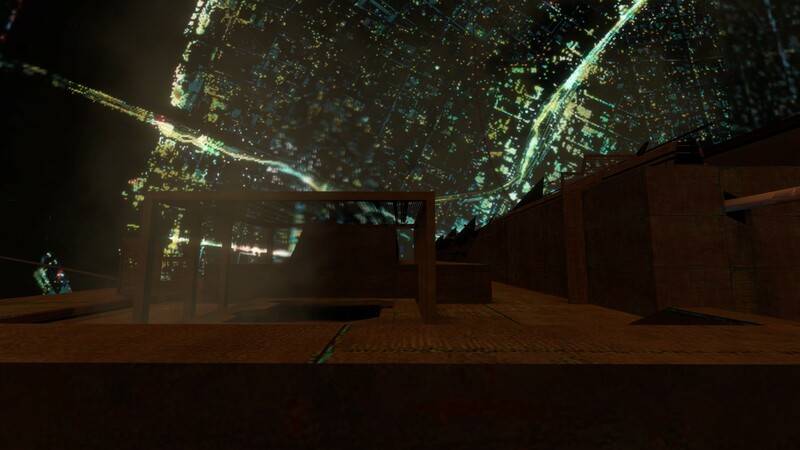 The cityscape should obviously be in the 3D skybox, so you can set the fog independently of the level itself. 3. I think your only recourse is to bring the fog in closer, or use the fake fog texture (or make your own gradient) to blur the edges. Fake fog can usually cause bloom to soften the edge and improve blending. But, I’m pretty sure in Valve’s example itself, it’s a hard, ugly edge. So I was testing a few paths for moving platforms and obstacles and this happened. I don’t get what’s going on here, but I like the idea! It’s been rather quiet. Kind of forgot this was still going on! With 10 days left, is anyone still working on stuff? It hasn’t been at the forefront of my mind, but I haven’t come up with anything I would have done in this whole time either. 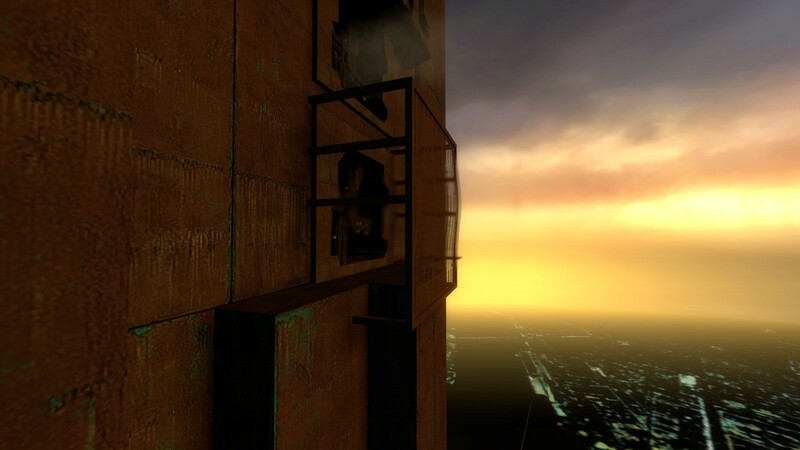 I gave Half-Life 2: Update a play, up to Black Mesa East, but nothing really clicked for me. I’m sure the theme is frustratingly clear to the people who created it, but I still find it really perplexing for some reason. I’m sure the theme is frustratingly clear to the people who created it, but I still find it really perplexing for some reason. As you constantly remind us. As always, my entry turned out to be more work than I anticipated, but it’s done. Hope everyone enjoys it. Ooh, I look forward to a new sneakyspeckman map.